Unusual bottles from Virginia Wine Country, for the wine-o who has it all. For wine loving-Virginians, day trips into our backyard Wine Country have become as common as Chardonnay and Cab Franc in tasting rooms. So even though your wine-loving wife or BFF might welcome a gift of Virginia wine this month, their wine fridge may already be stuffed as full as their turkeys. Solution? How about something guaranteed to be opened immediately, like a Virginia sparkling wine? Or maybe a “splurgy” bottle for dessert? Or even a Portuguese sour cherry wine served up in tiny chocolate cups? There’s plenty to choose from. Many of these can be ordered online, but where’s the fun in that? Make the drive, and you can snap some photos of you “shopping.” Slip a pic into their gift bag. That way, even if your gift is one among many, they’ll be sure to remember where it came from. Thibaut-Janisson’s may be the go-to Virginia sparklers these days, but there are plenty of others to love, too. The historic Effingham Manor Winery just opened in Nokesville a few months ago, and sells a pretty Pinot Noir-based sparkling. General’s Ridge Vineyards on the Northern Neck has a tasty Chardonnay/Chardonel bubbly with a Semper Fi label. And Greenhill Vineyards’ Blanc de Blancs is a classic Chardonnay with crisp green apple, pear, and minerals. Know any wine lovers with crazy-big war libraries? 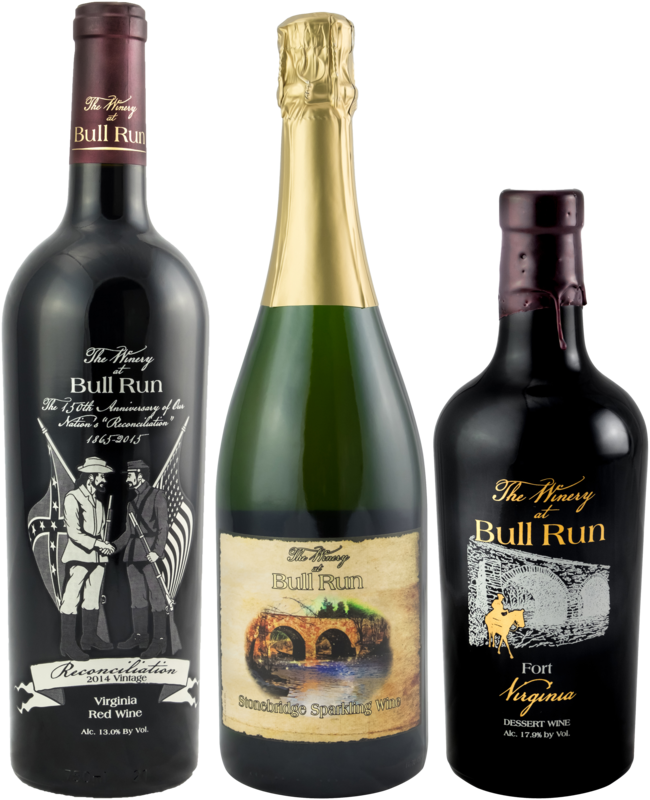 They might enjoy the Winery at Bull Run’s Civil War Three-pack. One each of sparkling, red, and dessert wines for $110. Espionage junkies, check out Black Ops, a “proprietary (red) blend using clandestine winemaking techniques” at Pearmund Cellars. The Black Ops 4th Mission will be released this month. Or pick up one of the cheeky Covert Wineworks bottles – complete with ‘40’s pin-up girl labels – from Vint Hill Craft Winery, including “Gigi” Pinot Gris, “Vivian” Viognier, and “Bebe” Cab Franc. Think a grape is a grape is a grape? Think again. Some grapes can have more tastes than an everlasting gobstopper. In Virginia, Petit Manseng is a good example of a multi-talented wine. Pick up a bottle of Prince Michel Winery’s Tres Bien for a taste of the typical tropical Petit Manseng – dessert-style – and then visit Granite Heights Winery for their stainless steel-fermented dry version. Boom. Now that’s a gift. Here’s another: Touriga. Typically known for the role it plays in port wine – and for being the national grape of Portugal – it’s also making some headway here in Virginia. See our picks below for a few that will let you taste Touriga in Virginia three ways: as a Rose, a dry red, or a tawny port-style. The Norton grape is another that lends itself to a variety of stylistic expressions, and Norton also gives Virginia some impressive “firsts.” Richmond was ground zero for the creation of the grape, which was hybridized from an indigenous American vine in the early 1800’s by Dr. Daniel Norton, and Norton is thought to be the oldest American grape cultivated commercially. History-lovers might appreciate a bottle of Philip Carter Winery’s Oatlands Norton; the oldest American grape from the Founding Family of American Wine. Or perhaps a bottle from Chrysalis Vineyards, which has the world’s largest Norton vineyards. Or the very reasonably-priced Norton from Orange County’s Horton Vineyards, whose owner Dennis Horton reintroduced Norton to the East after all the original vines were destroyed during Prohibition. Starbucks’ pumpkinification of the world may have outlasted most taste trends, but cinnamon is the spice we all come home to eventually. Paired with apple, it can be a fun sipper as hard cider, like Winery at Kindred Pointe’s Ciniful, or a fruit wine like Peaks of Otter Winery’s Cinfulicious, an apple wine infused with cinnamon. Winery at Kindred Pointe also makes a Bourbon Cider and a Ginger Cider that are holiday festive. Plus they have some awesome firepits out behind their equestrian-inspired tasting room, and even some walking trails. Sweeter red wines are a hot trend, and also helpful to have on hand over the holidays for that guest who doesn’t “do dry.” An affordable estate-grown Chambourcin like Saude Creek Vineyards’ Sweet Rebellion is very Virginia, where this versatile hybrid thrives. And it pairs really well with chocolate. Just sayin’. Dessert wines make a terrific gift. The full-bottle price tag on the typical half-bottle of dessert wine makes them pricey, so people often pass them up when stocking up. But as liquid dessert or paired with salty cheese, they’re a perfect end to a meal. And Virginia winemakers, who are free of the cultural and legal restrictions of Old World wine countries, use the dessert wine space to experiment like kids with Christmas chemistry sets. Howard O’Brien at Chateau O’Brien says he got the idea for his Ice Apple Wine from a friend in apple-happy Normandy. At $54 for a 375 ml bottle, it’s a generous gift, but also one your recipient is unlikely to already have. The same goes for Arterra Wine’s native yeast-fermented Late Harvest Tannat ($49 for 750 ml), which is similar to port but without the fortification from spirits. At $20 a bottle, Rockbridge Vineyard’s V d’Or is liquid gold of honey and oranges, a bargain that blows away some of the best Sauternes. Rockbridge has been making this lovely blend of Vignoles, Riesling, Vidal Blanc and Traminette for 20 years. Morais Vineyards makes a Cherry Wine similar to ginjinha, a classic Portuguese liqueur. Serve it as a shot with a cherry at the bottom, or in a small edible chocolate cup. 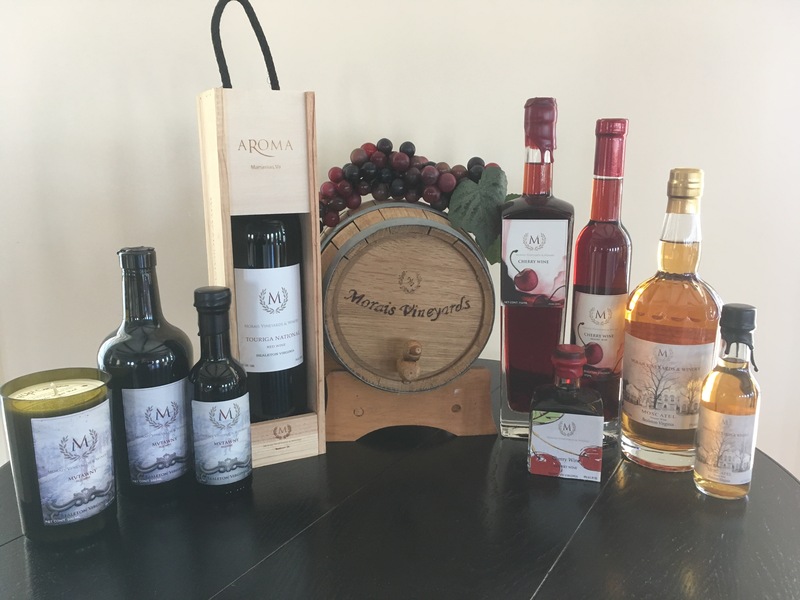 Morais Vineyards also gets our vote for Awesome Virginia Wine Gifts of 2017, because you can pick up their Cherry Wine, Muscat-based Moscatel, and MV Tawny in 7-ounce bottles, so you can try them all. Perfect little stocking stuffers. If the wine cellar is full, consider sending your mid-state friends and family a gift certificate from The Virginia Tasting Cellar in Farmville. Tastings include pours from wineries all over Virginia in a warm brick and log tasting room downtown. Or, for a constant reminder of wine country, even on the darkest of Mondays, the new 2018 Virginia Wine Country mini desk calendar (from us, at Virginia Wine in My Pocket) has plenty of photos and wine events to get you ready for every wine weekend. Happiest of holidays, from all of us at Virginia Wine in My Pocket. And cheers!